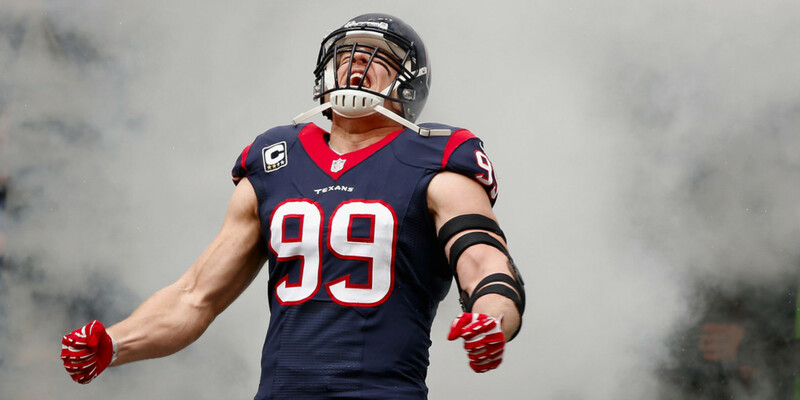 Who else is pumped for the JJ Watt Show on HBO? Since 2001, HBO has made the month of August significantly more interesting with impeccable footage and access from NFL camps all over the league. Each Tuesday evening, viewers are drawn by marquee players, foul-mouthed coaches, rookie hazing, and the annual heartbreak of roster cuts…or the relief of a fringe guy making the roster. 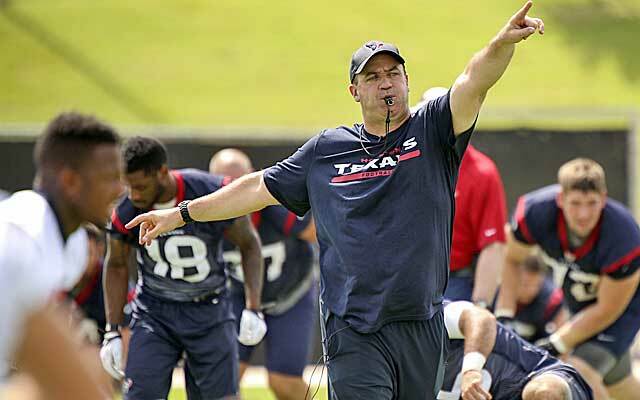 We already know about the scrimmage fight between the Texans and Washington. In his first 4 seasons, Watt is a 3-time Pro Bowler, 3-time All-Pro, twice defensive player of the year, and easily the best player in Texans blue. On top of his 57 career sacks he’s already recorded, Watt scored 4 touchdowns last year…3 on offense. With the success on the field comes the fame off of it. The former Wisconsin Badger has quickly become a big celebrity. When he’s not playing security for the Zac Brown Band, he’s off meeting his boyhood crushes, Britney Spears and Jennifer Aniston, and becoming best buds with Arnold Schwarzenegger. Yes, we all envy Watt’s life and it will be fun getting a closer look at it for the next 4 weeks. Apparently he gets caught offsides for the first time tomorrow night and he doesn’t take it well. Just shake, err, Nae Nae (?) it off, JJ. Viewers will learn quickly that O’Brien isn’t too shy to drop a barrage of F-bombs. 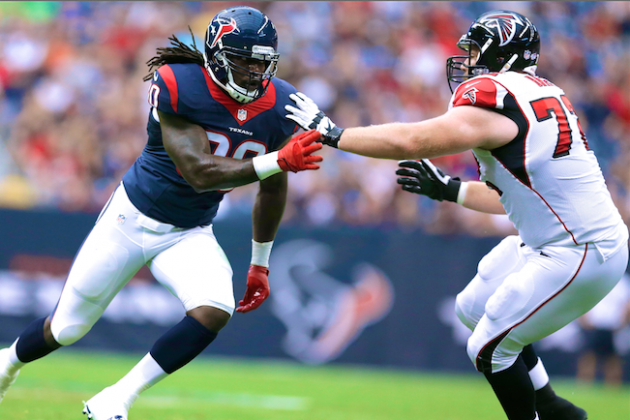 His forceful and driven demeanor are credited for the Texans improving their win total by 7 games from 2013 to 2014. You also can imagine he may have a few stories from his tenures at Penn State and New England. Might be worth noting that O’Brien’s playing experience only goes as far as playing defensive-end and linebacker at Brown University till 1992. This is a familiar setting for Brian Hoyer and Ryan Mallett, as they both took snaps under center for the Patriots in 2011. This time the stakes are higher as they compete to become starting quarterback of the 2015 Texans. A week into camp, neither quarterback has a leg up on the other yet. Hoyer started camp getting reps with the first team, likely because he had more starting experience with Cleveland. Mallett is better acquainted with the offense having come over in a trade from New England a year ago. A position battle that important should provide solid drama featuring two younger quarterbacks who have a history with each other, but also have a history backing up one of the league’s all-time greats in Tom Brady. The other angle, unfortunately, would be their insight on how they and Brady like their footballs prepared. Arian Foster has been a force for the Texans offense since taking over the starter spot in 2010. The 4-time pro bowler is also one of the more entertaining characters in football, as well as one of the most outspoken. Unfortunately having to to miss 4-6 weeks to a groin injury, it’s unclear how much air-time Foster will get compared to back up running back Alfred Blue. His recent proclamation as an atheist and want to spread that message could be talking point for him when the HBO mics are on. I always stick to the “Big Fish” rule, but whatever. It’s going to be weird not seeing Andre Johnson line up for the Texans this season. The 12-year vet and 7-time pro bowler ranks 2nd among all active receivers in catches with 1,012, all with Houston. Johnson took his talents to Indianapolis in the off-season, but that’s why they drafted DeAndre Hopkins…to prepare for life After-Andre. The former Clemson star took a big leap to #1 receiver status in his second pro season, catching 76 passes for 1,210 yards and 6 touchdowns. 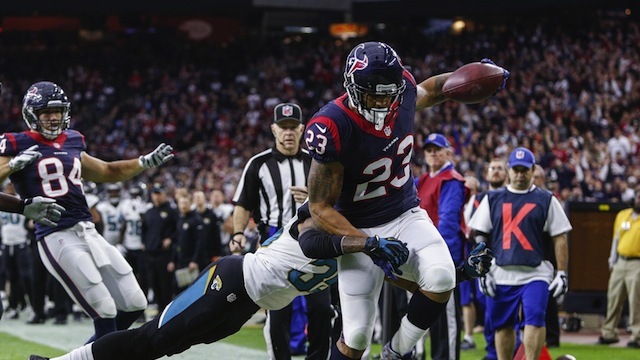 He’ll be lining up on the opposite end of the field from former Jacksonville receiver and D-III college player Cecil Shorts III. 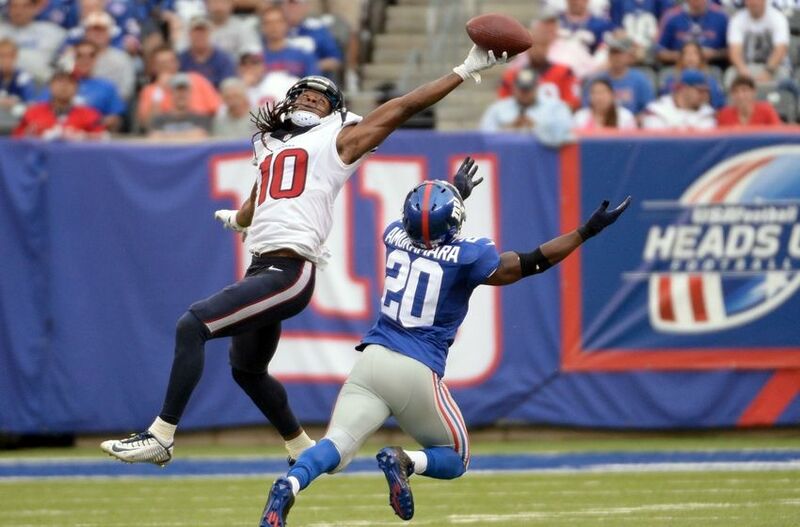 Shorts may have a better story than Hopkins, but it will be interesting to see them in action. The #1 overall pick from a year ago only played four games for the Texans last year, and made just 5 tackles. After a second knee surgery in December, Jadeveon Clowney has been rehabbing and targeting an August 17th return date before the season starts. Can’t blame Texans fans for being frustrated, especially when Clowney sat out a chunk of his last season in college to avoid further injury before the draft. Other news surrounding Clowney has to do with his father being arrested and denied bond after an attempted murder recently…so there’s that. Hopefully Clowney can get back to football on focus on blowing up running backs and quarterbacks like he did at South Carolina. There are a few more former Patriots who should make this season of Hard Knocks interesting. 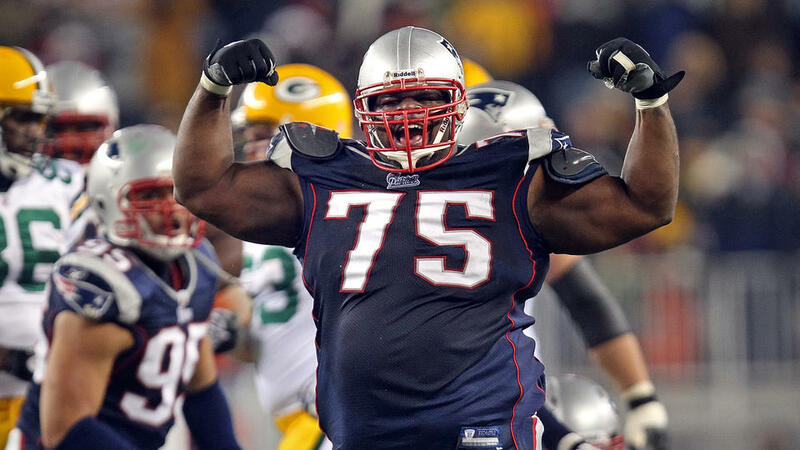 Super Bowl champion and 5-time Pro Bowl nose tackle Vince Wilfork comes over to Houston after earning another ring, and turning 33. An old defensive teammate of Wilfork’s, Mike Vrabel, coaches linebackers with the Texans as well. …Oddly, I’m way more interested in what Vince does on the basketball court than the football field, thanks to this sneak peak. “Modern Day Michael Jordan”…Wonder what Michael has to say about that. ‘Hard Knocks’ premieres at 10 PM ET/ 9 CT tonight, August 11th. Join me in Tweeting along to the episode LIVE or we can talk about it on Facebook.